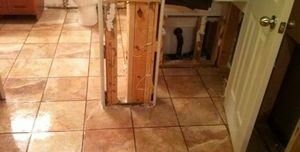 Eliminating all of the different difficulties that arise from a flooding event, pipe burst, water heater loss, or anything else requires skill and understanding of the industry at a level such as that of our water damage Carrollton team with 911 Restoration Fort Worth. When it comes to these challenges, our water damage Carrollton team knows that the best way to get on top of the situation, is to arrive quickly. Knowing this, our team makes sure to arrive within 45 minutes of your call for emergency help. To back up our ability to be on-site so quickly, we are also available 24/7/365 so that no matter what kind of catastrophe you find yourself in, we are only a phone call away. We take great pride in our ability to give people back their property quickly and looking better than ever too. If your business or residence is already submerged, then don’t wait another minute to get in touch with our water damage Carrollton team with 911 Restoration Fort Worth today! There are few professionals in the entire industry that have the experience, skills, and respect of the community like ours do, and one of the reasons we command so much is because we are always willing to help people, especially in preventing damages from taking place too. Make sure to check the hoses and fittings that link up your home’s appliances to the main water line. These can fail over time, so check and replace when needed. Take the time to ensure the trees around your home or business aren’t in danger of losing heavy limbs that might damage your roof during the next storm. Eliminate any roots that are pinching the pipes around your property in the ground as these may be near failure if the roots are too invasive. Clean out all of your gutters and downspouts so that you can be sure to prevent clogs and overflows which can ruin your roof. These are some of the major causes of water damage and how to prevent it from occurring, but there are plenty of others too, so don’t hesitate to ask if you have questions. Don’t let your gorgeous home or prosperous business suffer from the effects of a flood alone. Contact our water damage Carrollton team with 911 Restoration Fort Worth and get the help you need today! Taking on the eccentricities of a water invasion situation is not easy work, and that is one of the many great reasons why our team of water damage Carrollton technicians is always ready to take on a difficulty for you. We make sure to always put the customer first whenever we take on any sized project, big or small. In addition, we are completely dedicated to customer satisfaction, and for that we are profoundly dedicated to professionalism with everything we do. Our teams care so much about our clients that we will even go the distance and make sure that they have help filling out and filing the insurance paperwork that is needed in a claims process. If your home or office is already dealing with a flooding invasion of some sort, then contact our water damage Carrollton team with 911 Restoration Fort Worth for the best help in the industry today!